Before becoming a cat owner, I didn't realize just how much cats loved their solitude. I mean, I know that my father in laws cats always ran and hid when we came around, but well... my kids are just a little crazy. I think I'd hide too! But when we adopted our cat Stella into our family, I very quickly realized that it was just a cat thing. Seemed she was finally finding a dark, quiet place to escape to. It's no wonder cats like their little secluded cat houses. Our Stella would have one in every room if she could. But that would get rather costly.... but what if you could create your own DIY cat hideaways with 2 things you probably already have in your house? Today I'm showing you how. Find a box and an old t-shirt you no longer need. 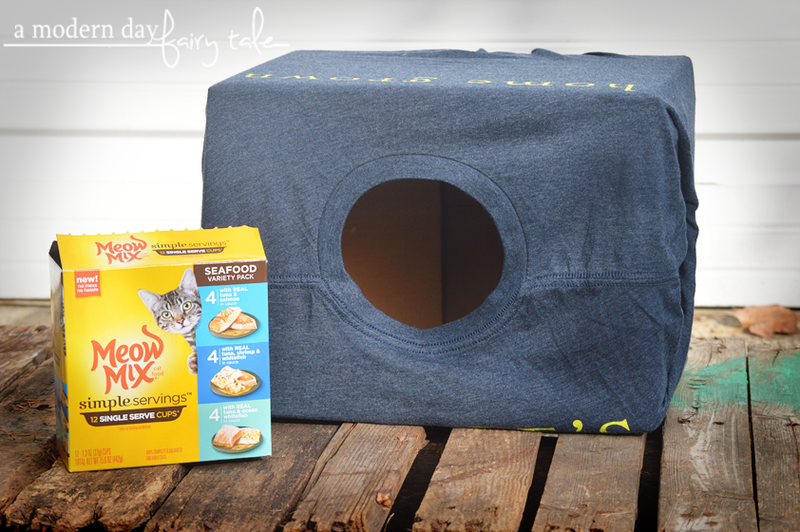 No particular sizes, the box just needs to be big enough for your cat, and the shirt big enough to cover the box. If you don't happen to have any old shirts, you can usually find them super cheap at your local thrift store. They don't need to be fancy! Now prep your box. Fold the flaps into the box, or just go ahead and cut those out if you'd prefer. Put the t-shirt over the box. The neck hole will be at the opening of the box. Tuck in the sleeves. Gather the excess from the shirt and tie in the back or use the rubberband to tie it tight. That's it! 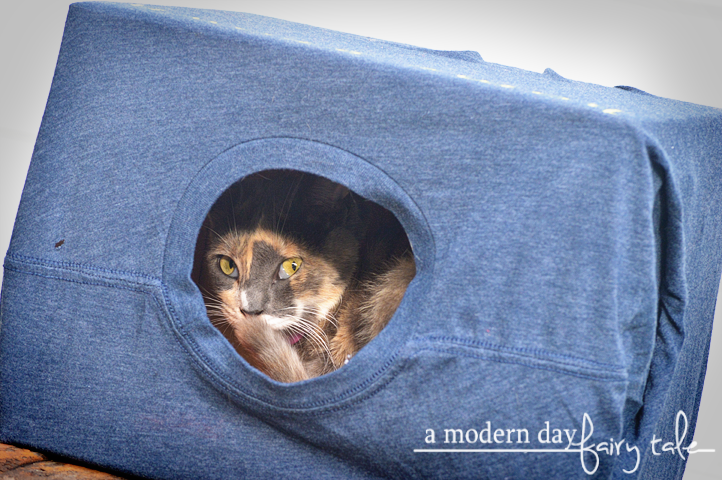 A super simple and inexpensive cat hideaway that your cat is sure to fall in love with! Speaking of simple, DIY projects aren't the only thing we like to keep simple for our pet! 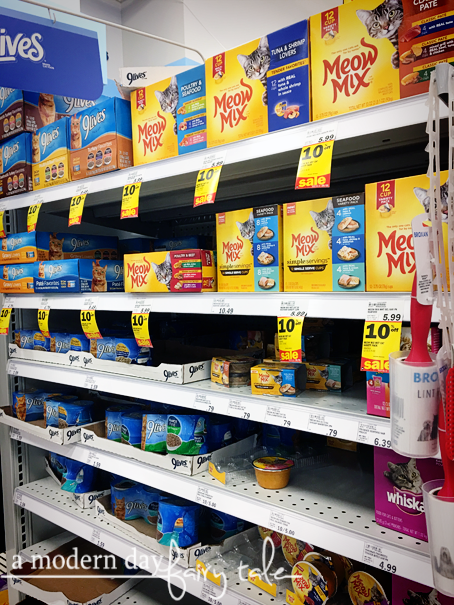 We like to keep her food simple too, so we headed to our local Meijer to pick up a delicious treat: Meow Mix Simple Servings! 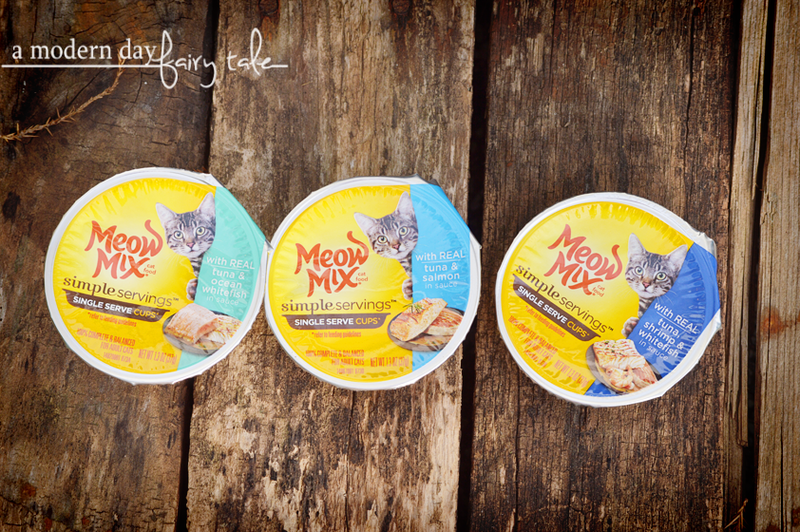 Meow Mix Simple Servings is a new, single serving of delicious wet cat food in a convenient, mess-free cup. 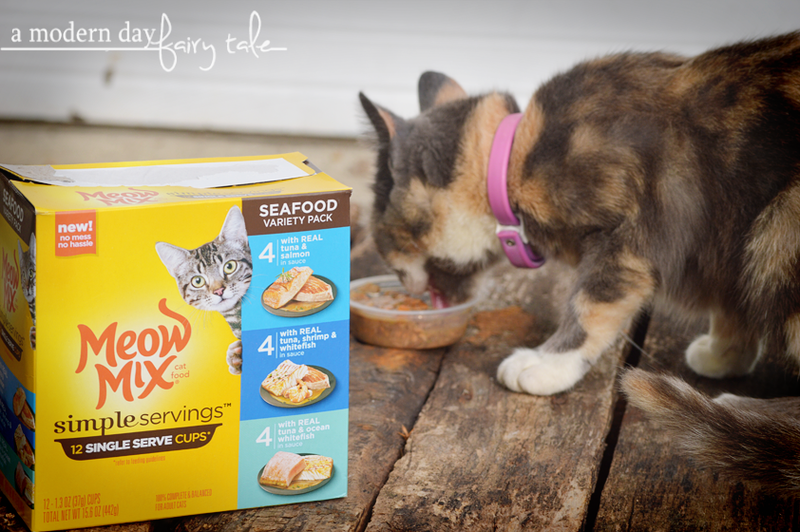 There are several great flavor options available, but our Stella enjoys a little variety so the Seafood Variety 12-pack is a great choice for her! But why Simple Servings? The answer is simple. While our pet loves her wet cat foods, we've found that she can very rarely finish a typical can before it dries out, and we typically throw out some each and every time. What a waste! With simple servings, they are single size portions... no mess, no leftover, super simple. They are also easy to open and easy to serve... you can serve right in the container it comes in or it slides out easily- no fork or spoon required. 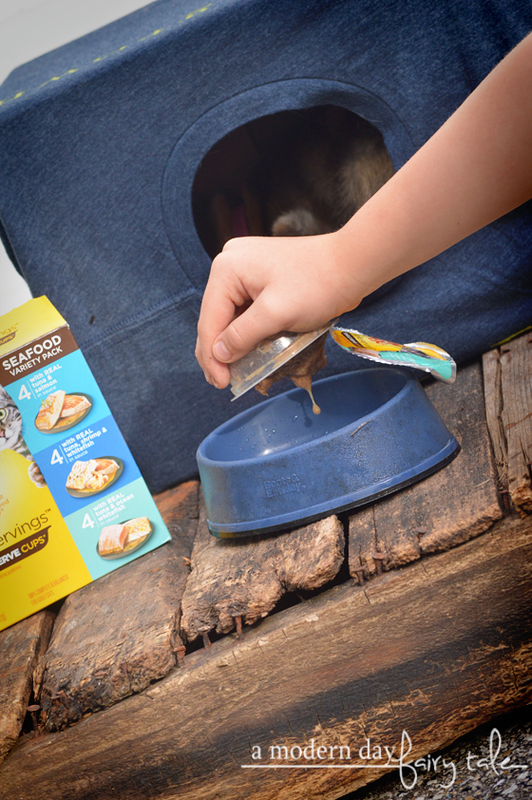 And your pet can enjoy pieces of real seafood (or poultry) in a savory sauce. Our cat LOVES it, never a leftover left! When it comes to pet care, this busy mom's motto is 'Keep it simple'. And just as the names suggests, Simple Servings truly does just that! And with this MPerks offer, you can enjoy 30% off! Offer lasts from 10/8- 11/04, so be sure to stock up! Visit this link to take advantage of these savings. Do you like keeping things simple with your pets? How can Meow Mix Simple Servings help? I've given Meow Mix dry food to my cats. I think they'd like the Single Serving Cups. I'll have to look for them in the store. my cats absolutely love boxes. The joke is, if you want to trap a cat, just put a box on the ground. They would love this easy diy hideaway!